The Dernogalizer | A blog about the politics of energy/environmental issues at the national, state, and local level. 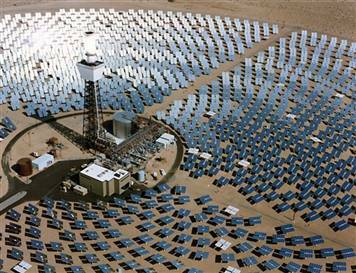 Look at that Solar Plant Destroying the Environment! It makes complete sense to me that there should be different environmental standards for a wind farm than a coal plant. The other minor-story the Post reports on is that some of the companies doing these green projects and received these exemptions aren’t exactly saints in the environmental arena. Now, if I were the guy in chance doling out grants for projects, I would choose a company with a clean record over one with a dirty one, but the unfortunate reality is that most of these companies have dirty records. Find me a green oil company that I can give an algae biofuel grant for. There are none! I should add that I ultimately want the dirty companies to start doing clean energy projects. That’s what environmental activists rightfully spend a lot of time doing, protesting dirty investments by corporations while pressuring them to make clean ones. So if Duke Energy has a history of building coal plants, and it decides it wants to build a wind farm, I’m not going to throw a fit! Heck, I’ll tell them to build two. What we don’t need is more hyped up negative stories to the public about how clean energy projects are dodging environmental regulations intended for dirty ones.